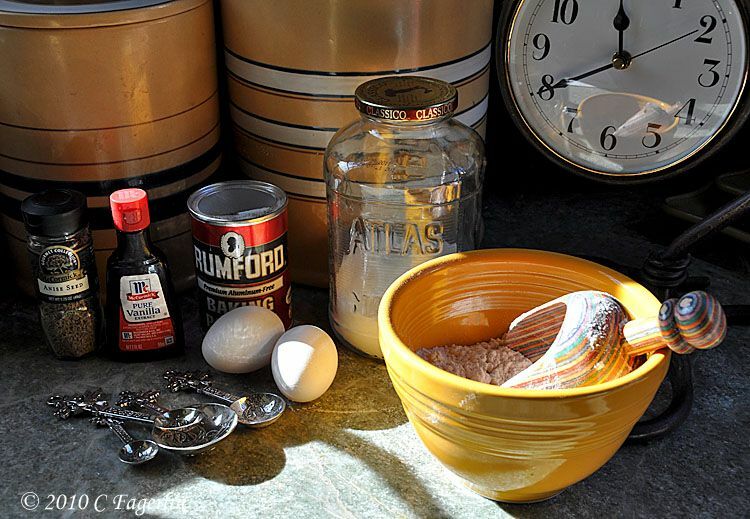 One of my favorite cookies of all time and so very easy to do. will rave over these very versatile and quick cookies. You can even have them on a casual buffet table for a "make your own" dessert! 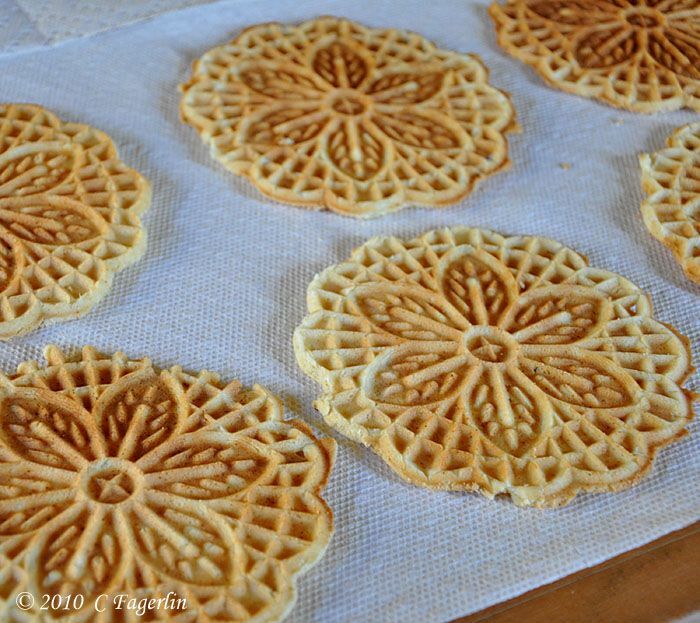 Pizzelle (singular pizzella) are traditional Italian waffle cookies made from flour, eggs, sugar, butter or vegetable oil, and flavoring like vanilla, anise, or lemon zest. Pizzelle can be hard and crisp or soft and chewy depending on the ingredients and method of preparation. 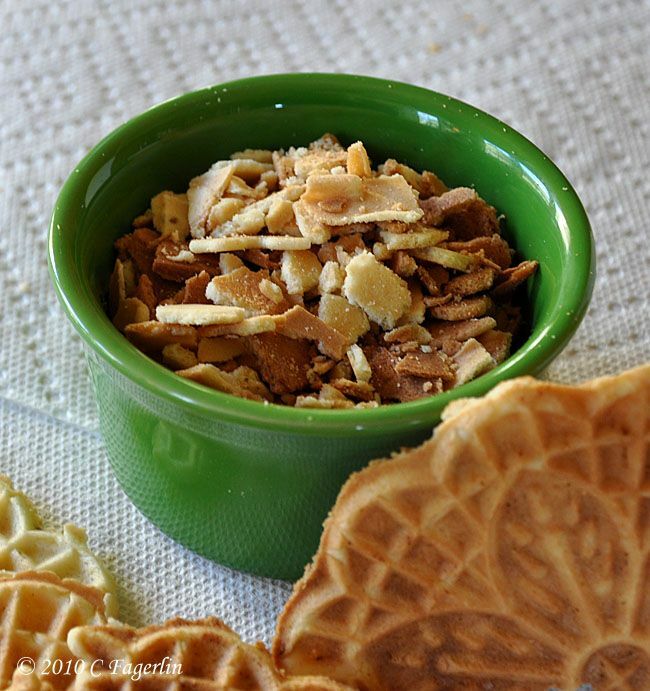 Pizzelle were originally made in the Abruzzo region of south-central Italy. The name comes from the Italian word for "round" and "flat". Many other cultures have developed a pizzelle-type cookie as part of their culture like the Norwegian Krumkake. It is known to be one of the oldest cookies, believed to have developed from the ancient Roman crustulum. 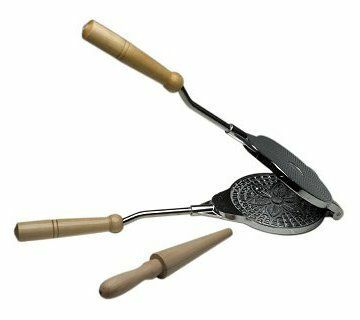 Traditionally the cookie dough or batter was put into a pizzelle iron, which was held by hand over a hot burner on the stovetop. Typically the iron stamps a snowflake pattern onto both sides of the thin golden-brown cookie, which has a crisp texture once it is cooled. 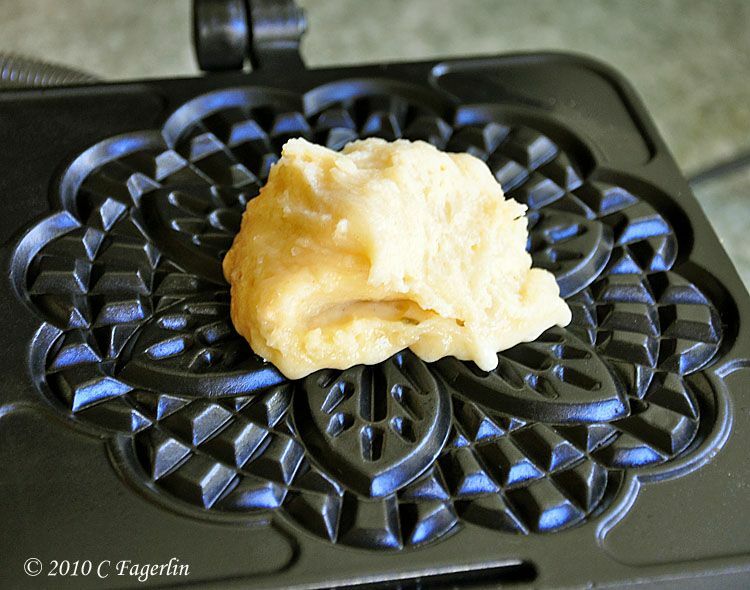 I use an electric pizzelle iron, which is very similar to a waffle iron, with a clamp to press the two sides of the iron together, which prevents the dough from puffing up. The dough is quite thick and should not be runny like traditional waffle batter. This is truly a cookie dough that is baked on an iron instead of the oven. the cookies are still warm and save it for sprinkles on ice cream sundaes. Allowing your iron to return to very HOT between each baking is the key to success. determines how long to leave them in the locked iron. 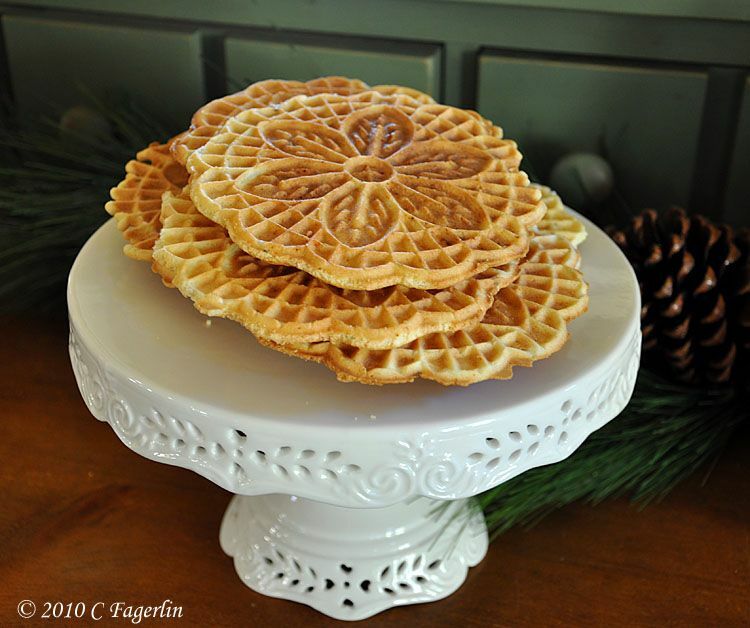 Pizzelle are popular during Christmas and Easter and are also often found at Italian weddings, alongside other traditional pastries such as cannoli. It is also common for two pizzelle to be sandwiched with cannoli cream (ricotta blended with sugar) or hazelnut spread. 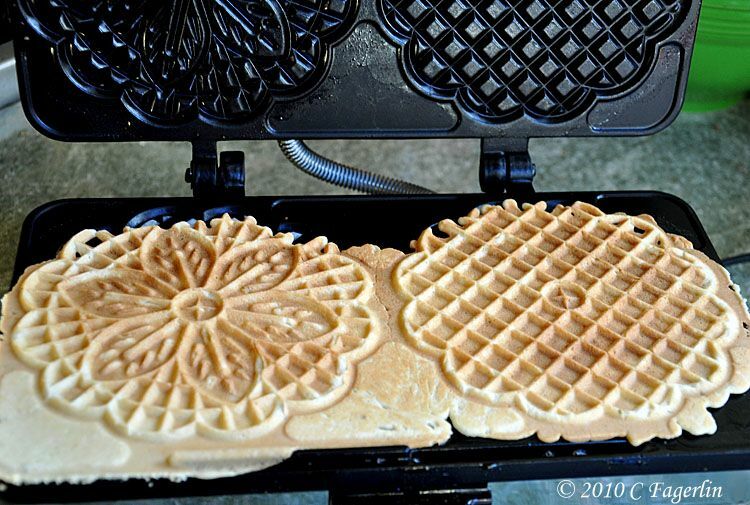 Pizzelle, while still warm, can also be rolled by hand or on a wooden dowel to create cannoli shells or waffle cones for ice cream. Remember ..... they are super easy, super tasty and always a hit with party guests or family. thank you so much for joining my party. I love waffles but I never got them hard and crispy, mine are always weak and chewy. But I prefer them crispy. Your pizelle look great and I have to look after such a pizelle maker. That snowflake pattern is just like made for winter. Really a versatile cookie varation. The spoons you show in one of your photos catched my eyes. Are they cup measures? They look like Antique Silver, very nice. I haven't tried making pizelles before, but I like all your wonderful photos that make it look like I might want to give it a try. I especially like your Fiesta collection. I have quite a bit of the new Fiesta, but haven't collected any of the older. I am a new follower. We are such pizzelle fans. I received an iron for my wedding and had never heard of them but have made them many times since. Yours make my mouth water. Yum. Yum. Never heard of this before. Love the pattern that the iron makes. I love pizelles, but didn't know there was an appliance to make them. Ahhh, something else to add to my wish list. YUM! Pizelles are so pretty, too, aren't they? I love them. 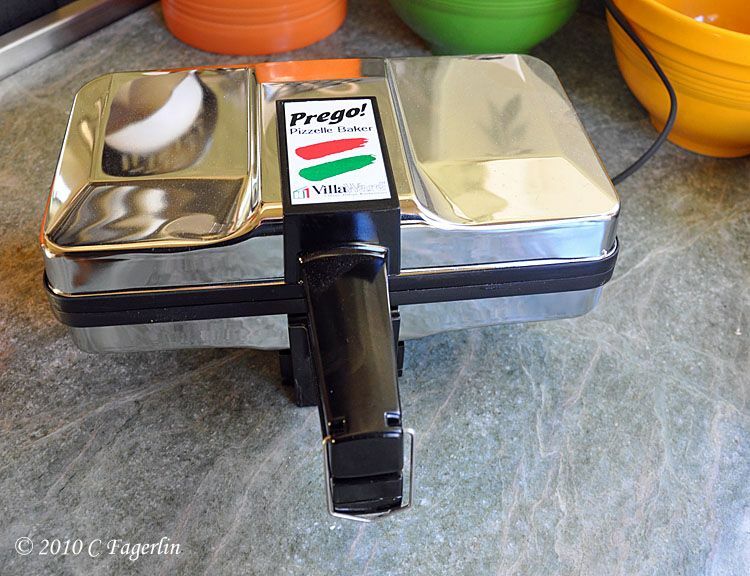 And now you have me wanting a pizelle iron! One more item for the wish list! All the pizzelle are long gone, need to make a few more batches! YUMMY. Thanks so much for stopping by to have a cookie with me, I do appreciate your visits. Johanna, those are little measuring spoons that came from one of our local hardware stores! I think the wife of the owner must love cooking and dishes because the housewares department has wonderful things for the kitchen and the table. 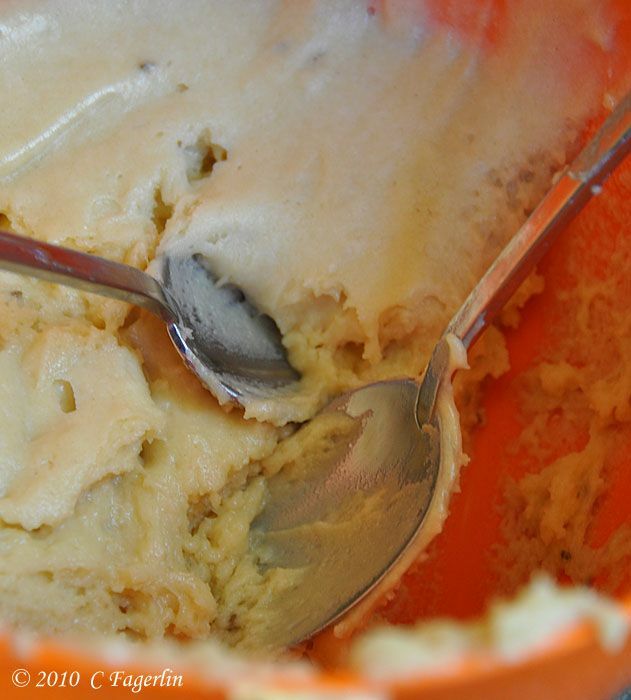 :-) Those little spoons have appeared here on TLRT before .... I think it might have been for Silver Sunday. These look quite fancy and yummy to boot! I'm your new follower and invite you to visit and follow me, too. Hi Candy! Oh, those are some of the prettiest treats I have ever seen! And they sound just delicious too. Your photos are gorgeous and I love how they look on the little cake stand. And, can I just tell you how beautiful your Christmas tree looks too? Just gorgeous! Thank you so much for linking up to our Cookie Exchange! goodness, i love pizzelles! 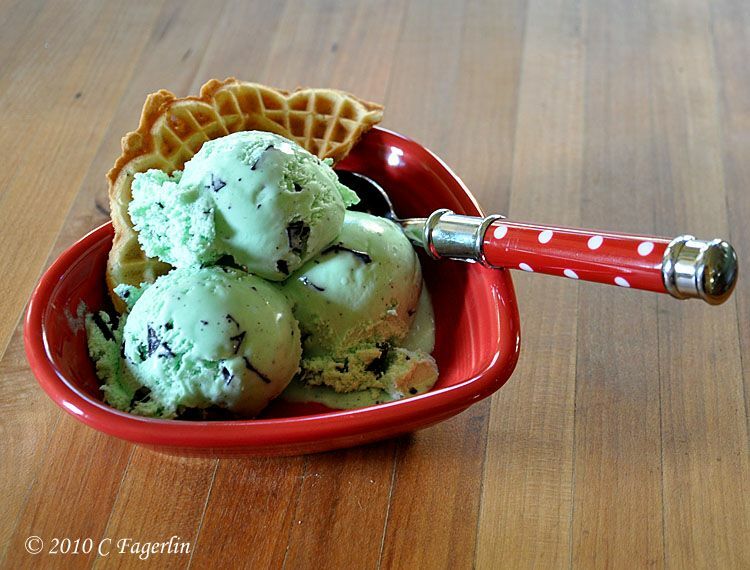 pizzelles and ice cream, why didn't i think of that!! Beautiful and looks very yummy! Too pretty to eat! Although I wish I could! They're beautiful! I just bought a new pizzelle maker yesterday! I bought my first iron 20 years ago, shortly after we were married, and it served me well until last summer. I hope this new maker produces the same thin crisp cookies. If you haven't discovered these cookies yet, let me tell you they make a great breakfast! I'm making these for the first time on Monday. Playing hooky with my daughter. Should be fun! I bought an iron last week. Can't wait. I love these. Maybe I will begin a hunt for an iron. Jayna, they are so delicious and the iron makes it just a breeze to whip up a batch!